In the midst of Bangkok’s steamy traffic stands a tall needle-pointed concrete obelisk of European design that raises more questions than get answered. Thailand’s Victory Monument, or Anu Saowari Chai Samoraphum (or just Anu Saowari for short) is situated in one of the busiest and most important traffic circles in Bangkok. However, very few people actually know what victory the monument is actually dedicated to. The Victory Monument was designed by Italian sculptor Corrado Feroci and erected under his direction in 1941. Corrado has a very interesting and long history with Thailand, and since his invitation to come to the Kingdom in 1923 to teach Western sculpture, he became responsible for the design of several significant bridges, monuments and buildings around Bangkok. During the Japanese occupation of Thailand in 1944, Corrado even became a Thai citizen and adopted a Thai name (Silpa Bhirasri). 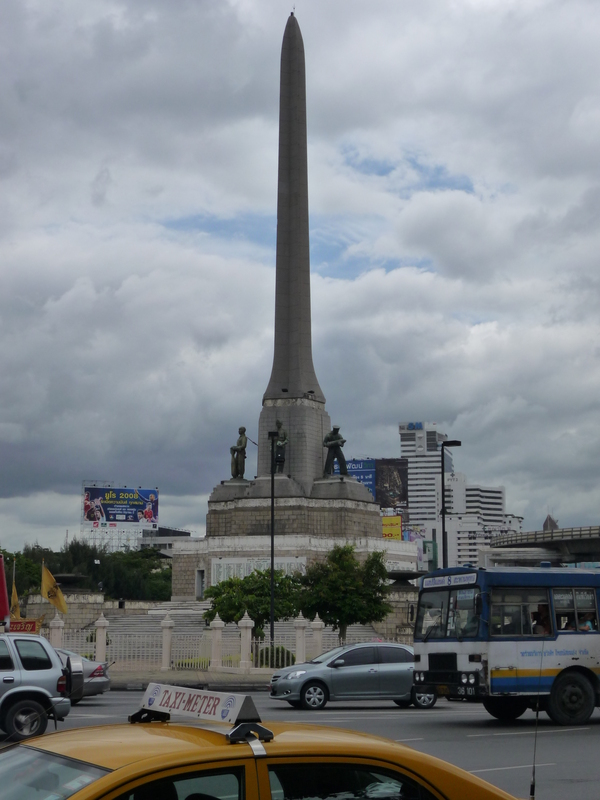 The purpose for the erection of the Victory Monument was in celebration during World War II of Thailand’s victory over France during the Franco-Thai war of 1940-1941. In essence, this war arose because Thailand had been forced to cede parts of French Indochina (essentially certain areas around Thailand’s borders with Laos and Cambodia) to the French in 1893 and 1904. Prior to World War II, Thailand had been in negotiations with France to try to rectify the issue. The French showed some willingness to rectify certain borders but did not appear willing to fully return the ceded areas. As a result, when France was occupied by the Germans in 1940, Thailand realised it was a good opportunity to retake possession of their land, given that France no longer had an ability to direct nor support its military assets overseas. The war itself consisted of approximately 60,000 Thai soldiers and whilst France had a force of 50,000 (with 12,000 being French and the remainder were recruited/conscripted from French colonies). Thailand had significantly more firepower including more armour and planes and the result was an easy win for Thailand with few casualties to either side, when taking into account the numbers of soldiers on either side. Interestingly, post World War II, France boycotted Thailand’s entry into the United Nations until Thailand agreed to return possession of the land in French Indochina. The monument itself is very reminiscent of many Western military monuments. It features a large single spire or obelisk that points to the sky, and at its base there are five outcrops, and on each stands a larger than life scale statue of a soldier. Each of the soldiers represents one arm of the Thai defence forces and many have a bayonet pointed up to the sky, presumably in a show of victory or triumph. The defence forces represented are army, navy, air force, marines and police. 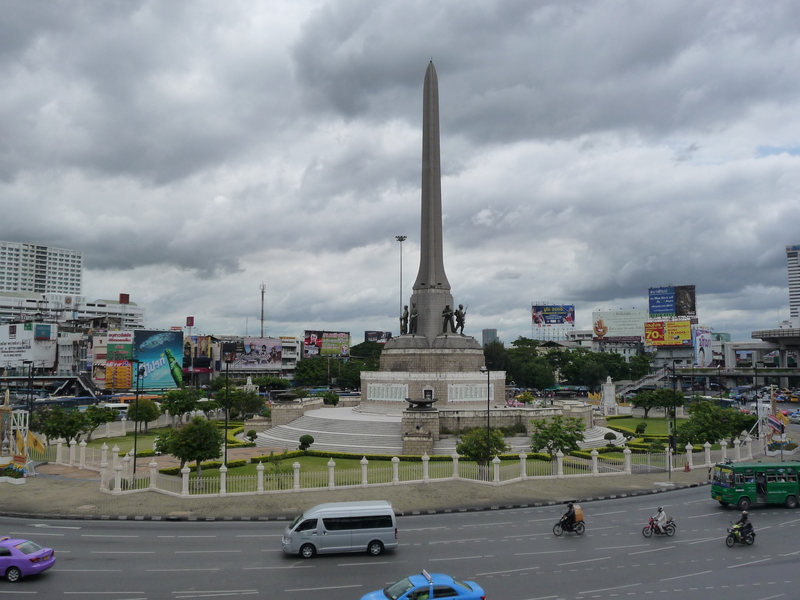 Victory Monument – sorry about the gray image but it was during the raining season. 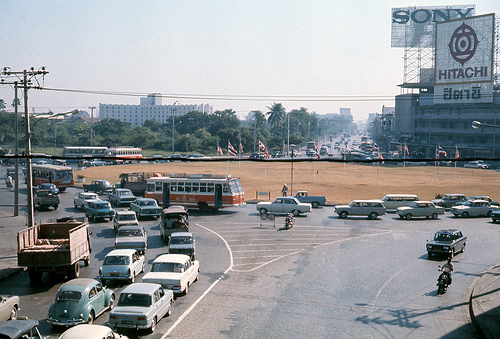 The monument stands at the intersection of Phayathai Road and Ratchawithi Road, and as such, it has been a main hub since its construction, for traffic heading from the old Dusit part of Bangkok heading north to the airport, east to the suburbs or south to the universities and Rajadamri/Ploenchit shopping areas. 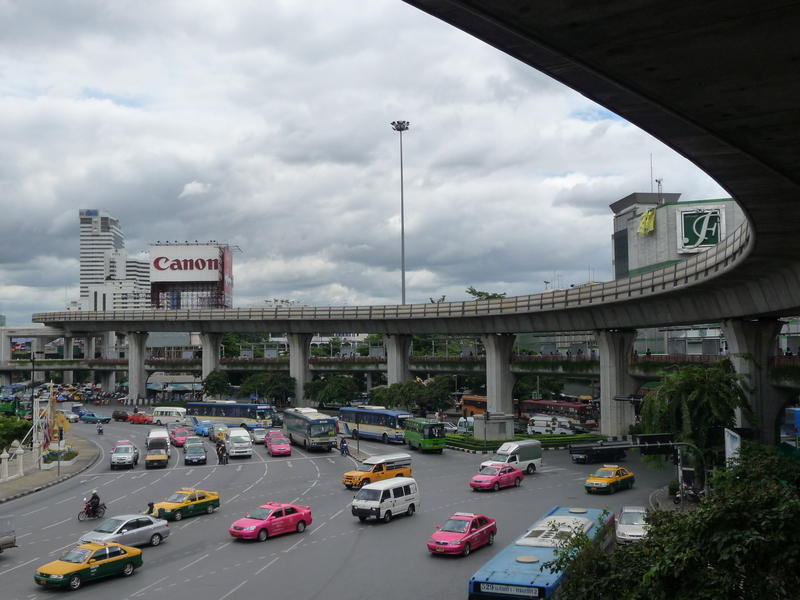 In more modern times, this intersection also has significance because the skytrain (BTS) runs past it (they actually had to circle the skytrain line around the intersection) and it marks the main access to enter one of several different elevated expressways that can quickly get commuters to other corners of Bangkok. Finally, the Victory Monument traffic circle also represents the hub for Bangkok’s public buses, with most routes accessing this intersection. 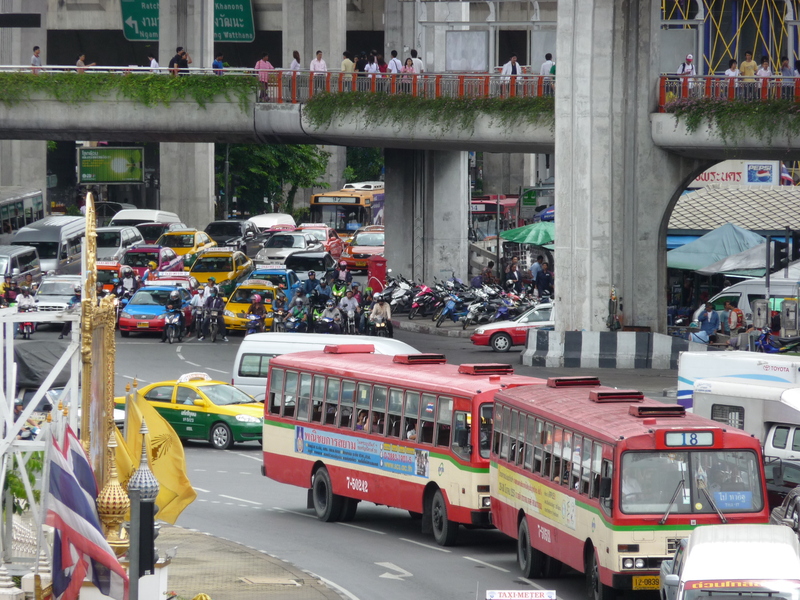 As a result, this traffic circle is the busiest in Bangkok and represents perhaps the most congested traffic in the city. Most tourists visiting Bangkok will at some stage pass the Victory Monument. The easiest way to get there is to jump on the skytrain (BTS) and head for the Victory Monument station. From the BTS station and the large pedestrian platforms just off the station, there are plenty of good photo opportunities of the monument. In addition, this part of Bangkok is quite interesting to explore. This area is a major shopping hub for Bangkok Thais and actually does not get a lot of tourists going beyond the BTS station. As a result, you could find some good deals on more unusual items in the shops. There are also some real hidden gems in the form of good and interesting restaurants. I will cover that in more detail in a later blog. This monument is a mystery to most (including most Thais). Ask locals what the monument is for, and see what interesting answers you get. Architecturally, this monument is very un-Thai, but its reason for being and place in Thai history is actually very fascinating. I have only given a light touch on the historic side but trust me when I say it is worthy of further research. In addition to the monument, this part of Bangkok is a bit off the beaten path by most tourists in that tourists do pass through but don’t really get down on the ground and explore the surrounding area. There are many interesting things here. This is definitely worth a visit for someone who wants to spend half a day exploring. Bruce Lee’s first martial arts feature film “The Big Boss” was filmed in Pak Chong in Thailand. Pete recently explored this town and uncovered many of the filming locations. Awesome urban art hidden in the centre of Bangkok. Chalerm La is a photographer’s dream.